Piero della Francesca portrayed Christ in two memorable works, The Baptism of Christ (c.1450) and the Resurrection of Christ (between 1459 and 1469). 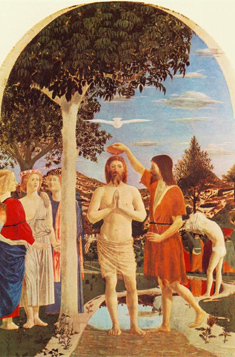 The dignified and classical figure of Christ in The Baptism is bleached white, suggesting the ritual purification of the baptism, and is juxtaposed with the whiteness of the tree. The dove, symbol of the Holy Spirit, is carefully placed directly above Christ's head. 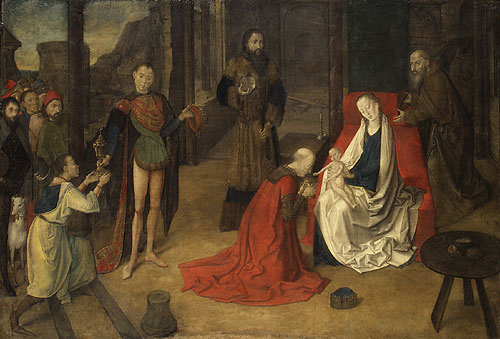 Three angels look on, separated by the tree from the mortal and physical world, and a neophyte stands behind John the Baptist, preparing for his own baptism. His nakedness is a symbol of humility, and contrasts with the grand outfits of the priests behind him. The landscape displays an unprecedented naturalism, and the outline of what may be Sansepolcro can be glimpsed, tiny and insignificant, in the background. 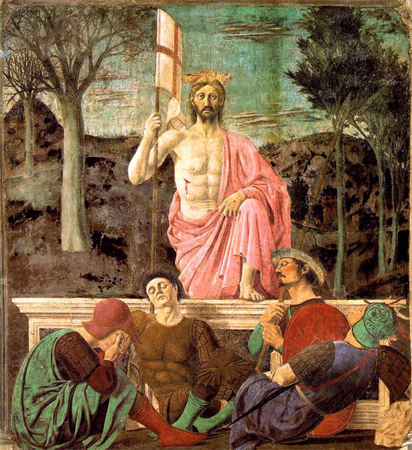 In the masterpiece Resurrection of Christ, the grave figure of Christ is reminiscent of an ancient hero. He is about to wake the sleeping figures, symbolizing the elevating of the world to a new plane of religious consciousness. From its inception, the influence of the humanist movement spread across Europe. The church councils set up in the early part of the 15th century served as meeting points, providing opportunities for cultural exchanges and increasing the circulation in Europe of classical manuscripts and new artistic ideas. 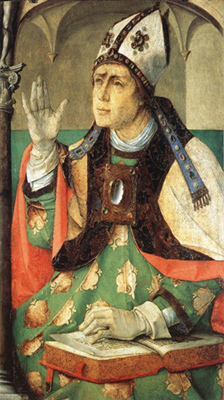 For example, Masolino worked in Hungary between 1425 and 1427 in the retinue of Cardinal Branda Castiglioni. Through this connection, the ruler, Matthias Corvino (1440—90), commissioned a series of illuminated manuscripts by the most important studios of the Po valley in the second half of the century. Through these contacts the slow penetration of Italian artistic and architectural ideas into western and northern Europe began. 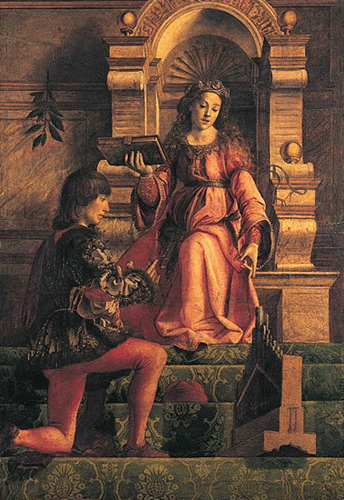 While the Gothic style prevailed, some of these new ideas were adopted, especially the excessively antiquarian style of the sculptors of the Po valley, which was evidently more in keeping with the Gothic ideal than the diversity of perspectival and compositional themes advocated by Leon Battista Alberti. The Late Gothic culture of the Burgundian courts had encouraged a realistic attention to detail. The quest for an ideal luminosity of colour was pursued by an assortment of Flemish artists who were capable of combining the sculptural values favoured by Claus Sluter (active c.1380) and his followers with a firm grasp of perspective that accentuated the feeling of depth in their paintings. This marked the birth of a vigorous pictorial tradition that extended from the Low Countries to the Alsace of Martin Schongauer (1453-91). It conquered even the most sophisticated Italian courts, like those of Florence. Ferrara, and Urbino, with the works of van der Weyden, Justus of Ghent, Hugo van der Goes (c. 1435-82), and Pedro Berruguete (c.1450-1504) becoming popular. Before long, the "infinite landscapes" of van Eyck were emulated, with urban features added, in the portraits of Battista Sforza and Federico da Montefeltro painted by Piero della Francesca. The great age of Flemish painting, which was supported by the thriving merchants of Flanders, marked the rise of the technique of painting with oils on panels. 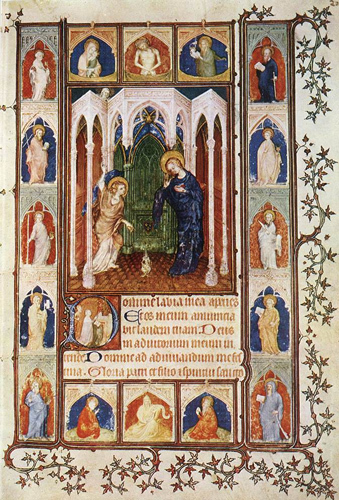 The skill and vibrancy of their work allowed the artists to give the fullest possible expression to Flemish figurative ideals, which originated in the workshops producing illuminated books such as the Les Tres Riches Heures du Duc de Berry, illustrated by the Limbourg Brothers and Jacquemart de Hesdin in about 1410. The polyptych of the Adoration of the Lamh, painted by the brothers Hubert and Jan van Eyck in 1432. was erected in Ghent Cathedral. At about that time. Jan painted the Arnolfini Marriage and the Rolin Madonna, which displayed a masterly use of colour that defined with vibrant precision the smallest and most distant detail, in an almost photographic manner. Portrait painters sought to idealize human characteristics, while the ample draperies of the costumes gave a solid presence to the figures, who were often absorbed in reflection and clearly contained in their own space. This decade also saw the start of the career of Rogier van der Weyden, who had an intense interest in the compositional and sculptural themes of wooden sculpture. He dramatically articulated complex forms in his compositions, accentuating his animated figures, and their unambiguous gestures and expressions. It is clear that the artist's consuming interest was for the figures as compositional factors, and the Madonna of San Luca shows his sensitivity, which allows subtle variations of emotion in his figures to disturb the symmetrical limitations that his predecessors imposed on their work. 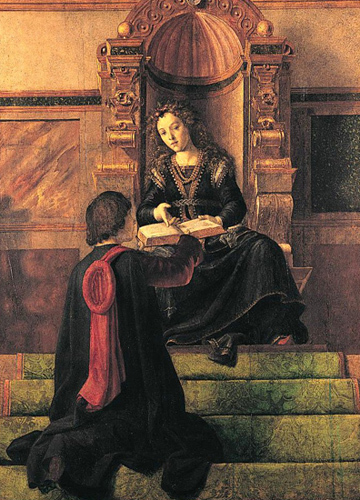 His journey to Italy in 1450 involved an exchange of works and ideas with other artists, and the impact of this can be best traced in portraiture. While van der Weyden accepted the influence of Italian painting, the Bruges artist Hans Memling (c.1430-94) exemplified the distinctiveness of Flemish art, by developing and expanding the compositional techniques within his own culture. Also in Bruges. Petrus Christus (died c.1475) was influenced by van Eyck, but in a more simplified style and with an intimate, devotional tone, while Dieric Bouts (died 1475) showed great affinity with van der Weyden - he painted figures set in beautiful, shimmering landscapes. Bouts also experimented with perspective, and was highly influential. 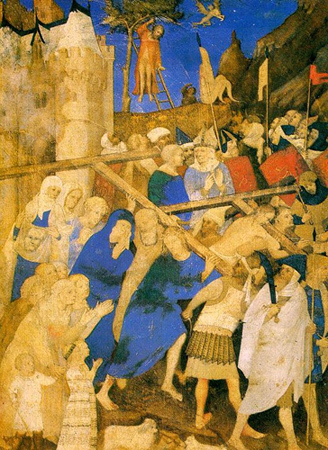 His major work was the altarpiece in the church of St Pierre in Louvain. Painting in the north, then, was also going through a radical transformation, with innovations of techniques and ideas in figurative and landscape painting. (b ?Hesdin, Artois; fl 1384; d after 1413). 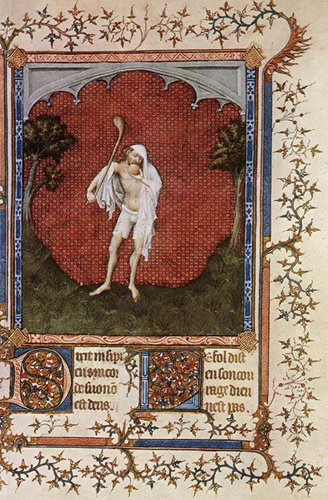 South Netherlandish illuminator, active in France. He was one of the Netherlandish artists who moved to France to work for the French royal family from the middle of the 14th century. By studying the work of Jean Pucelle and Italian painters he not only evolved his techniques of modelling and rendering of space but also modified the realism characteristic of Netherlandish painting to develop his own more refined style. On 28 November 1384 Jacquemart was paid for the first time by the administration of Jean, Duc de Berry. The payment concerned expenses that he and his wife had incurred in Bourges; he was also reimbursed for his clothing for the following winter months. Thereafter he was paid a regular salary by the Duc. In 1398, while he was working in the castle of Poitiers, he, his assistant Godefroy and his brother-in-law Jean Petit were accused of having stolen colours and patterns from Jean de Hollande, another painter in the service of the Duc de Berry. Jacquemart stayed temporarily in Bourges the following year. He may have been in contact with John I of Aragon in 1409. South Netherlandish painter, active also in Italy. 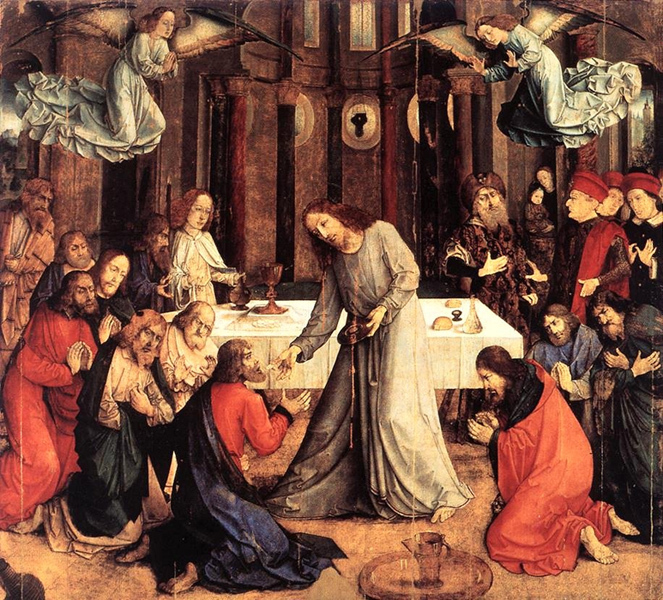 He is commonly identified with JOOS VAN WASSENHOVE, master at Ghent, who is said to have gone to Rome some time between 1469 and 1475. Many of Justus’s works have been attributed to the Spaniard Pedro Berruguete, and problems remain in this area. Justus is documented between 1473 and 1475 in Urbino, where he ran a workshop, and he was the only major Netherlandish painter working in 15th-century Italy.